Fuerteventura is one of the Canary Islands in the Atlantic Ocean off the coast of Africa. It is the second largest of the islands. Fuerteventura is a paradise for sun, beach and water sports enthusiasts.The stable climate makes Fuerteventura the ideal place for all kinds of surfing, a fact recognized by both professional wind surfers and wave surfers, who have settled on the island. There are no fewer than 152 beaches along its coastline – 50 kilometers of fine, white sand and 25 kilometers of black volcanic shingle. 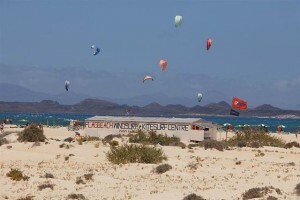 The economy of Fuerteventura is mainly based on tourism. Primary tourist areas are located around the existing towns of Corralejo in the north and Morro Jable in Jandia. The town and resort of Corralejo is located on the northern tip of Fuerteventura. The beaches in Corralejo are the resort’s major attraction. The area has 11 kilometers of fine sand starting 3.2 kilometers outside of Corralejo, along with some smaller bays along the coast. In addition, there are several miles of sand dunes located nearby. Flag Beach is a long (6-7 km beach, 3km kite surf zone) sandy beach with reefs at both ends that go out to sea about fifty meters. The kite surf spot is upwind from the wind surf spot, which is in front of the old location of the Flag Beach centre. Flag Beach is a long sandy beach with reefs at both ends that go out to sea about fifty meters. 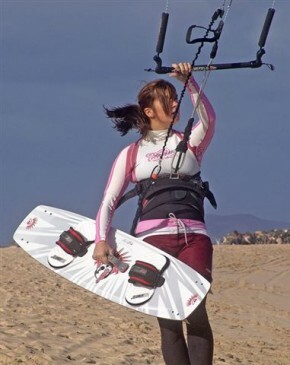 The total length is 6-7 km, of which 3 km is a dedicated kite surf zone. The kite surf spot is upwind from the wind surf spot, which is in front of the old location of the Flag Beach centre. Depending on wind and weather conditions we will go to other beaches as well. We cooperate with one of the best surf schools in the area, with over 20 years of experience. The water is in the summer 22C and in the winter 18C. Because of the side shore wind the water is flat to choppy. On spring lows, some rocks close to the shore and the reef about 200 meters to the north will be exposed. On the beaches on the north shore of Fuerteventura you’ll find reef breaks, beach breaks, white water, and tubes. The wind is side shore from the left. In the morning the wind is light and it builds up to a steady 15-20 knots at 14:00. The best months for kite surfing are March to November. This is when the sea tends to be flat and the wind consistent. During the winter months it can become too wavy and though it might be good on the occasional day it cannot be guaranteed. When there is no wind at Flag Beach you can try Cotillo. That is just around the headland from Flag Beach with rocky outcrops every hundred meters or so. The winds are mainly cross-on from the right. You might see or ride some big waves in the winter. In the summer the waves are smaller. Check out the waves in Fuerteventura here. You find a map of the surf spots in the area here. Fuerteventura is one of the Canary Islands, in the Atlantic Ocean off the coast of Africa. Being a major European tourist resort there are numerous airlines servicing the Canaries, as well as many charter tour operators. If you arrive at one of the other Canary Islands, there are several connections to Fuerteventura. Fuerteventura’s El Matorral Airport is situated just 6km to the south of the capital Puerto del Rosario. In addition to direct flights from Europe Binter Canarias offers around 23 flights daily to Gran Canaria and around 5 flights daily to Tenerife North. Ryanair has 20 destinations with direct flights to Fuerteventura. Two express ferries run 7 trips daily from Corralejo/Fuerteventura to Lanzarote, and 7 ferry trips daily the other way. The ferries departing from Puerto del Rosario/Fuerteventura to Arrecife/Lanzarote are slower than the Corralejo/Playa Blanca route. Also, 5 ferries depart weekly from the capital Puerto del Rosario to Las Palmas, the capital of Gran Canaria, but again your faster route to Las Palmas is via the Morro Jable (south in Jandia/Fuerteventura) jetfoil route. Read more about going to Fuerteventura. We seek out other surfspots on Fuerteventura. 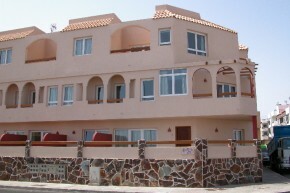 Casas Quesmadas on Flag Beach. You can try kite surfing on Flag Beach, which has strong steady winds. On a surfboard in Fuerteventura. Surf classes on the beach.